2-4-7 CARS will carry and use defibrillator equipment within their Taxis. A Moray taxi firm is believed to have become the first in Scotland to operate and carry a defibrillator in one of its cars. 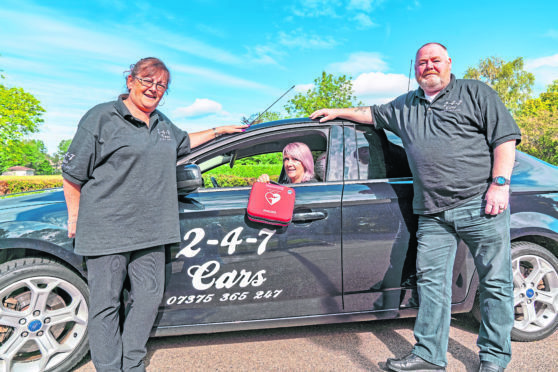 The owner of the newly launched 247 Cars service has invested in one of the devices in case it is needed to save the life of a member of the public or a passenger. Three employees carried out first-aid training on Tuesday so they were qualified to perform CPR and use the defibrillators properly. Business owner and driver Moira Spence used £980 of her own money to pay for the device, and is planning to fundraise for more money to buy three more for the rest of the fleet. She came up with the idea because her own father previously suffered a heart attack. She said: “My dad had a couple of strokes and a heart attack as well. And I had a friend who suffered a heart attack. Taxi drivers should have training on basic first-aid skills and it’s good for them to know how to use a defibrillator. Ms Spence said she was keen to help out in the case of a medical emergency as she was aware of recent ambulance shortages in the Moray region. She said she would make sure a taxi driver was always on shift who was trained how to use it. She said: “I know sometimes the ambulance service is quite short and it’s something we can to do give back just to help the public. “We are going to be fundraising to get some more, and that is in the early stages just now.